Thailand is about beautiful beaches, romantic islands, crazy parties and budget shopping. There are many places in Thailand but we chose Bangkok, Pattaya, Koh Phangan & Koh Samui. So, we could enjoy city life, island life, chill around beaches and party all night and most importantly we could shop till we drop! We booked around two weeks earlier, Air Asia was the cheapest from Bangalore to Bangkok. Visa was on arrival (for Indian Passport holder), you can save few bucks and time (you don’t have to be in a queue) by applying before. There is an option for an express visa which costs 200 Thb extra per visa, and you can skip the queue (Recommended). Visa cost – 2000THB (non-express). Please carry your photo as per Visa Guidelines. We wanted to be in the city centre so that we don’t waste time in commute, get transport easily and have options for the vegetarian restaurant nearby. So, after research and checking reviews and ratings, we decided to stay in Novotel Sukhumvit 20. 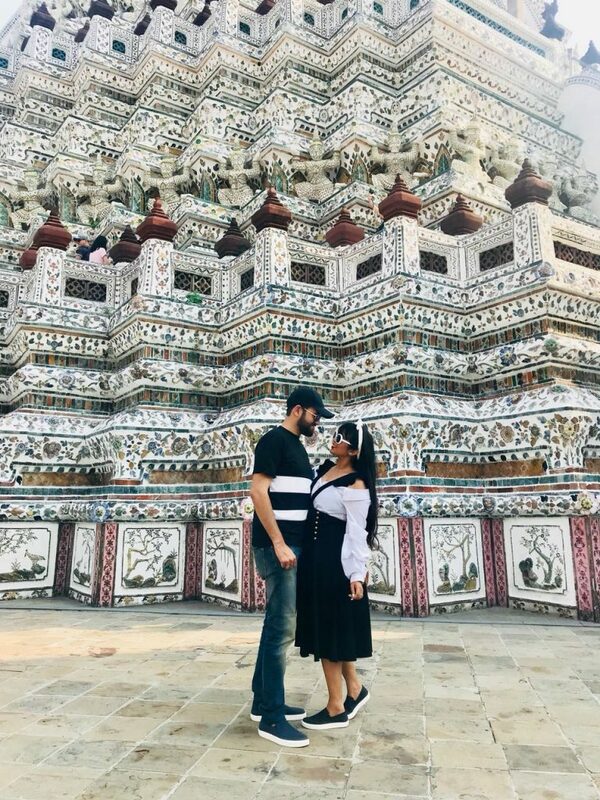 This post is for Bangkok & Pattaya for Koh Samui & Koh Phangan read here. Bangkok has two airports Suvarnabhumi Airport & Don Mueang International Airport (DMK). Air Asia lands on DMK and from DMK to the hotel, you can get a taxi outside the airport for 300-400 Baht, or you can book an uber or grab taxi. Sim– We pre-booked our sim through Klook.com for Rs 315, collected it at the airport and enjoyed unlimited 4G for 7-days and 100 Thb talktime. 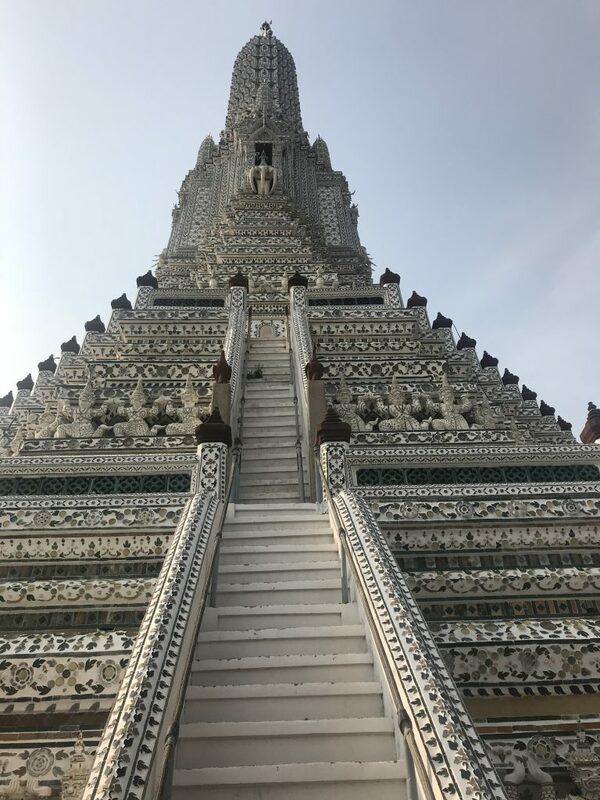 Wat Arun or Temple of Dawn is a beautiful Buddhist temple located at the side of Chao Phraya river. 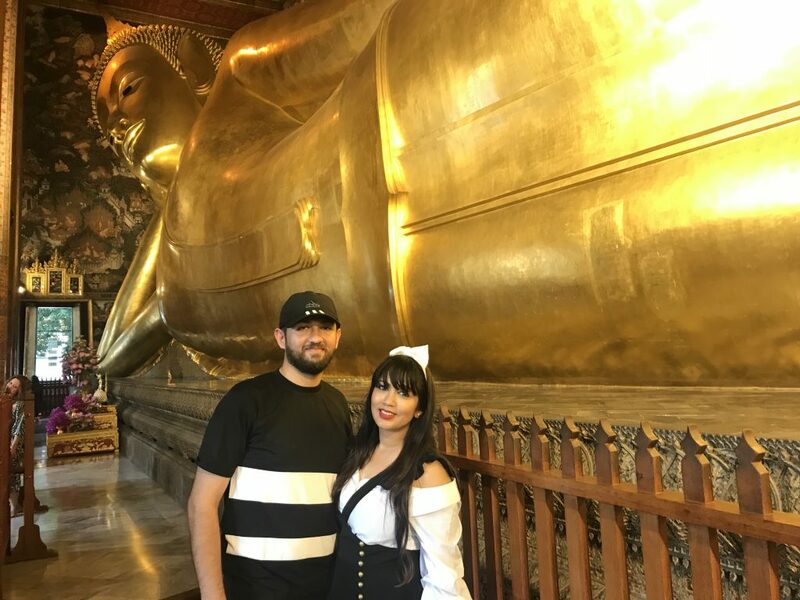 Wat Pho (Reclining Buddha)- It’s a giant reclining Buddha that measures 46 metres long and is covered in gold leaf. It’s an easy ten-minute walk between here and the Grand Palace. Grand Palace- We couldn’t visit this as it shuts at 4:00 PM. So, be on time. Transit- These three you can be covered in one go. You can either go by cab to wat Arun directly or take a water taxi. We chose water taxi as we love local experiences. Water Taxi will cost around 50 Thb each. After Wat Arun you can get another water taxi to Reclining Buddha at 4 Thb, and from here you can walk to Grand Palace. 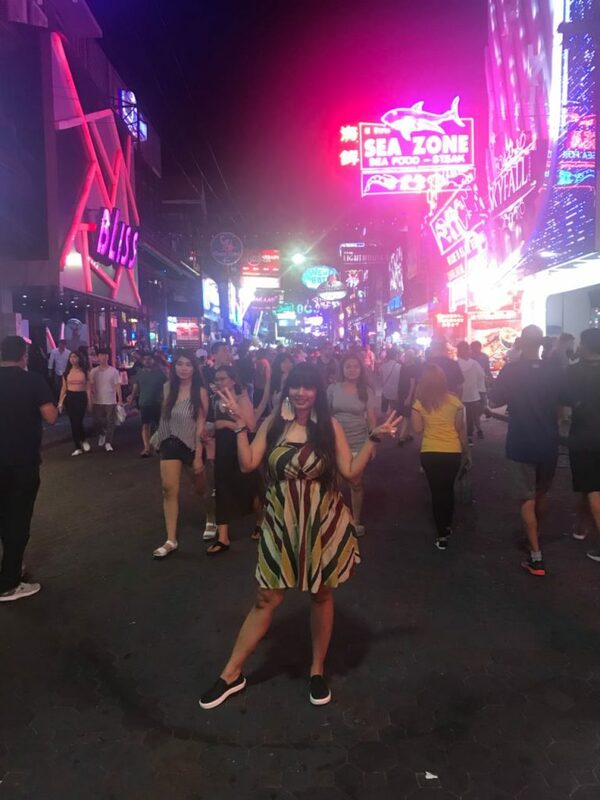 We didn’t stay in Pattaya, we just went there for a night to see the World-Famous “Walking Street” and oh boy! it was one hell of an experience. It’s a Party Street for whole 1 km, where there are lots of nightclubs, go-go bar, pubs, ladyboy shows, shops and its open whole night. We did club hopping, took a spa, spent nearly 4-5 hours there and came back to Bangkok. Transit– So if you plan to do same you can hire a local taxi and ask him that you want to stay in Pattaya for 4 hours and get a return journey fare. Our taxi Cost was 2500 THB. 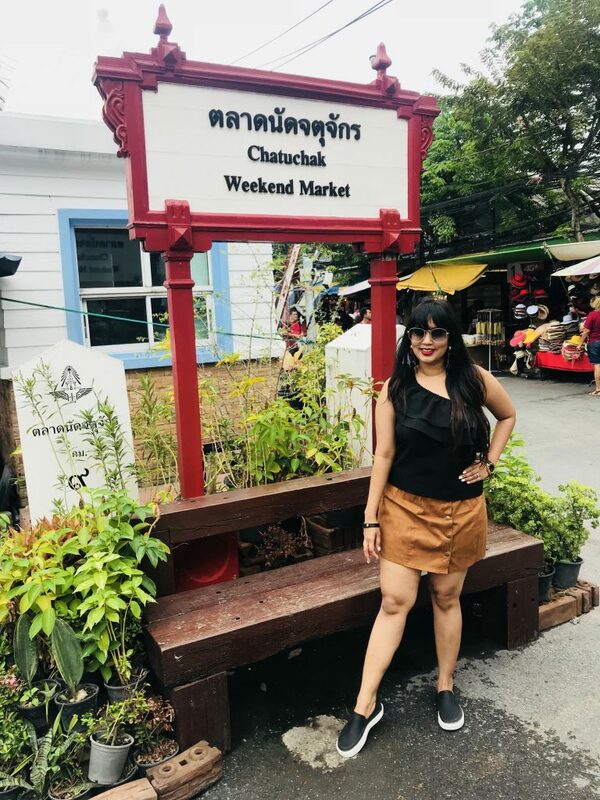 So a saying goes for this Market “If you can dream it up, Chatuchak probably has it” and its mostly true. It’s World’s Largest Weekend Market with over 15,000 stalls. We bought a lot of clothes, sunglasses and accessories. 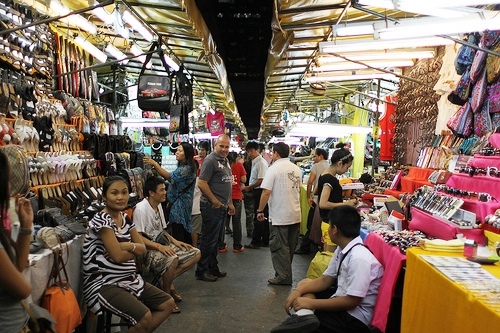 Do try this Market, so plan Bangkok trip on a weekend its open from 9 Am- 6 Pm. Its a place for tourists to fill up the suitcase with cheap souvenirs and other Thailand goodies. You will find loads of knock-offs for Bags, Tshirt, Watches. You might get Mixed reviews about this market, if you are not a good bargainer, avoid this place. We got few Souvenirs from here. 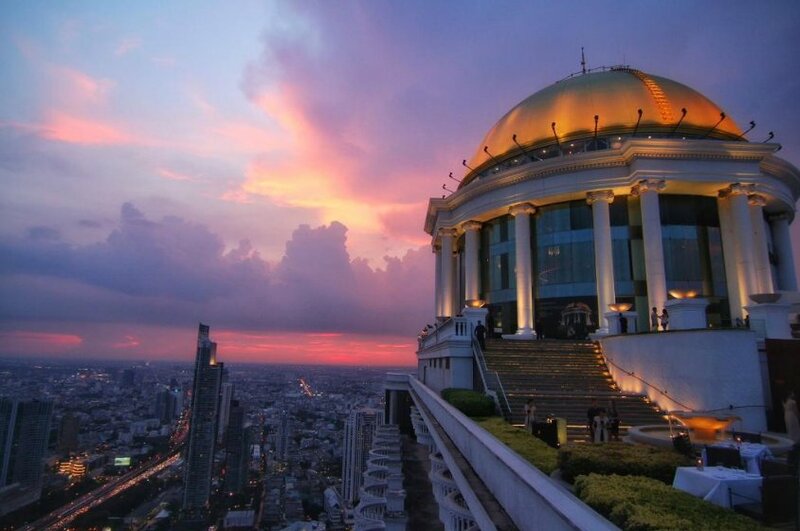 The sky bar, Lebua is one of the most touristy bars in Bangkok for its spectacular view from the 63rd floor, its outstanding Dome and of course for the Hangover movie. Quite expensive but its worth the view during sunset. For inter City Travelling, you can take Cab or Subway. For hiring local cab always compare price with Grab Taxi and install the app as you would get first-time discounts. Bangkok has lots of vegetarian and Indian restaurant, you can try Maya Resturant & Bar in Sukhumvit 22. Fruit Stalls are readily available. We couldn’t cover Floating Market, but if you got an extra day, do try that. If you are with Family, Stay a day or two in Pattaya and you can visit Tiger Park, enjoy beach and water sports. Forex- As per Visa Requirement, you have to carry minimum 10000 Thb per person or 20000 Thb per Family. So, either carry your extra currency in THB or USD. Don’t Carry INR as you won’t get good conversion rate. Carry a Forex card, If you have one as its safe and economical. Massage Parlors are available everywhere in Bangkok & Pattaya, We would recommend you do try them.